Goodman Manufacturing produces a variety of furnaces for home and business use with features such as multi-position or dedicated downflow air direction, variable blower speeds and a control panel with a light that blinks when something has gone wrong. If the light is blinking six times rapidly, pausing and then repeating, troubleshooting is needed to figure out what is causing the problem and how to resolve the situation. Turn off the Goodman furnace and examine the power cord to ensure the cord is plugged into an outlet with at least 115 volts power. Most home outlets are 120 or more, but contact an electrician if you are unsure. Disconnect any other appliances from the outlet and move the secondary appliances elsewhere. When the light is blinking six times rapidly, this means the power volt polarity has gotten switched. 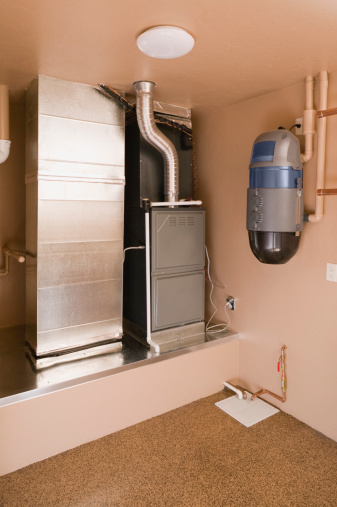 Reset or replace the circuit breaker or fuse to reset power to the furnace. Wait five minutes before restoring power. Check all intake and outtake air registers throughout the home for possible blockages. Contact Goodman for service if the light continues to blink, as the pressure switch hose may have gotten clogged with water or the wiring is reversed. These issues require professional assistance. Turn the furnace off until service arrives.